Clandestinely developed during the post WWI-era during which Germany was forbidden from developing, producing or owning armored combat vehicles, the Panzer I served as a proof of concept. Manufacturers and engineers became acquainted with the creation of modern fully tracked combat vehicles and soldiers were familiarized with the driving, maintenance, logistics entailed by fielding an armored force. Once war began, not only did these experience prove invaluable, the tanks themselves, armed only with twin machine guns, nevertheless proved formidable weapons against ill-prepared enemies. 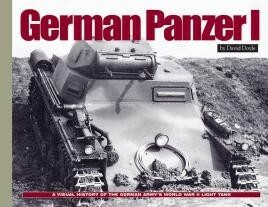 Spread through 168 hardbound pages, over 200 photos document all variations of this, the cornerstone upon which Germany's famed panzer force was built. David Doyle takes a close look at the Panzer 1, which formed the backbone of the German army's tank divisions and gave them such an edge during the first years of the war. Brilliantly illustrated. This is an excellent photo-reference for this diminutive but important little tank, and would serve just as well as a coffee table book or reference book for a modeller, as well as the general AFV or WWII buff. Highly recommended. For the modeller, these Ampersand titles are a real boon in terms of real-life crew modifications and inspiration for diorama vignettes. For the armour modeller who likes making dioramas, then there are plenty of ideas in here so provide some inspiration. A thoroughly recommended book, with excellent print quality, and positive value for money.